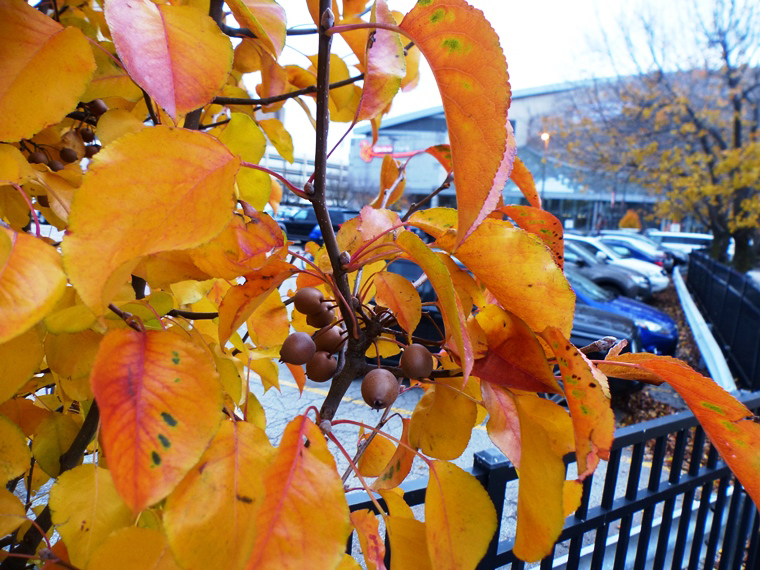 Experts say the callery pear tree and its many varieties are crowding out native plant species. BLOOMINGTON, Indiana – Every spring, neighborhoods around Indiana shine white with the blossoms of a landscaping staple. The callery pear tree and its dozens of variations have become the cheap and fast-growing tree of choice here and across the nation. But the trees have also become one of the most pervasive threats to the state’s natural resources. A Monroe County expert on invasive species says state officials are allowing the tree invasion to happen in order to save business owners’ bottom line. Ellen Jacquart, chairperson for the Monroe County Identify and Reduce Invasive Species group, said the Indiana Invasive Species Council submitted a list of invasive species to the Indiana Department of Natural Resources’ Natural Resources Commission with the hope that the plants on the list would be made illegal for sale or purchase in the state. In July, the commission preliminarily adopted the list of invasive plants to ban in the state with one major omission. The callery pear tree and its many varieties threaten Indiana's native plants. The Indiana Department of Natural Resources does not deny that assessment. In a statement, Megan Abraham, director of the DNR Division of Entomology & Plant Pathology, says economics played a role in the omission of two invasive plant species from the proposal. "After reviewing all of the species that are included in the rule it was determined that callery pear and Norway maple would have the largest economic impact to small businesses in Indiana if removed from trade," Abraham said. "In order to get the rule through the process efficiently and in a timely manner it was decided to leave off those species and review them at a later date to be included in the rule." According to a recent article in The Washington Post, the callery pear tree began as an attempt to create a hybrid pear tree resistant to fire blight, a disease that nearly wiped out pear trees in California. An Oregon scientist named Frank Reimer found that the Chinese fruit tree species resisted fire blight and could be used to breed with European pears to protect them from the disease. Other scientists expanded on his work, and even undertook dangerous missions into China to gather more seeds for experiments. The seeds collected in China would eventually be bred with other pear varieties and on their own. In the late 1940s the resilience of a callery pear descendant, the Bradford pear tree, named for a former head of a U.S. Plant Introduction Station, led to the species being chosen for planting on the east coast. The trees would thrive wherever they were planted, but botanists and ecologists nationwide soon found they were spreading on their own and taking over areas where native species usually grow. The invasive callery pear tree can be found in many parts of Indiana. Scientists began researching and writing about the trees’ spread in the late 1990s and early 2000s. In Indiana, the warning signs for the invasive nature of the trees are recent history. In 2009, the Indiana state legislature created the Indiana Invasive Species Council to detect, prevent and monitor invasions by non-native plant species that threaten the state’s natural resources. The council worked to develop a comprehensive list of all the invasive plant species in the state and how dangerous they were to the local ecology. In 2012, the researchers graded the callery pear and its offshoot varieties as highly invasive, noting that it had “negatively impacted Indiana state-listed or federal-listed plants or animals,” and displaced, killed or hybridized plants in at least 20 percent of the areas where the callery pear was found. The main factor keeping the tree from spreading beyond control is its inability to pollinate its own species. A Bradford pear tree cannot pollinate another Bradford pear tree due to its genetic similarity. Horticulturists have developed dozens of varieties of callery pear trees. “So in the last probably 30 years, horticulturists have developed dozens and dozens of new cultivars of callery pear,” Jacquart said. “They go by the name Aristocrat and Chanticleer and Cleveland Select and Autumn Blaze, and every one of them is a different genetic individual that has slightly different characteristics. Jacquart hopes people learn about the threat of the callery pear and convince lawmakers to include it in the ban. The preliminary list of invasive species is being reviewed and could be signed into law by the end of the year. Hoosiers have a chance to see the proposal and speak out on what will be in the final rule. In April 2018, the DNR asked Hoosiers to avoid planting the trees. 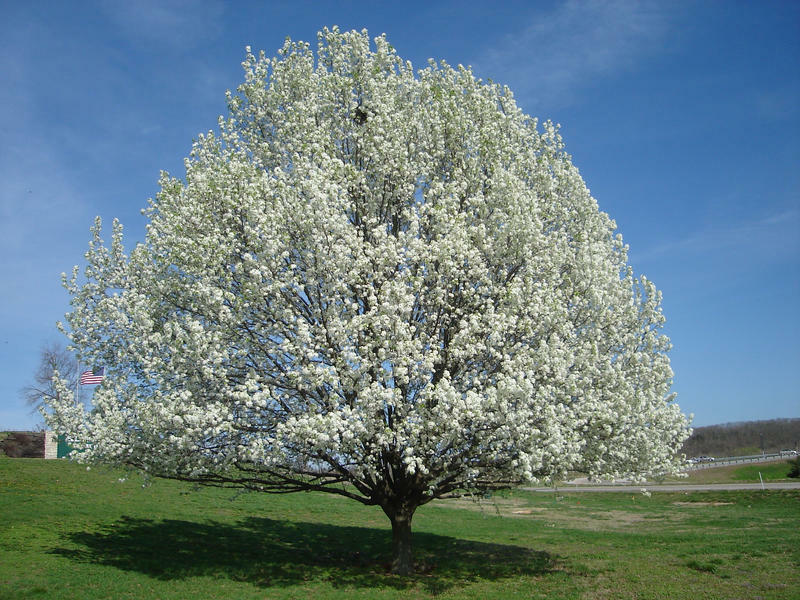 DNR officials say an aesthetically pleasing and environmentally friendly alternative for the callery pear trees is the serviceberry tree, which sprout similar white blossoms, or eastern redbuds, which bloom lavender flowers. After a plant disease wiped out the pear crop in California in the early 1900s, scientists sought to find a pear tree that could survive the fire blight. They went to China and brought back the callery pear tree. A century later, the pear trees have spread throughout the United States and threaten to crowd out native species of plants here in Indiana. State officials have drafted plans to ban dozens of invasive species of plants, but not callery pear trees and its varieties. Invasive species expert Ellen Jacquart says the state knows the destructive potential of the trees, but has put economics before the environment.